Jason File, Chelsea BA Fine Art Alumnus, is exhibiting at the Ryder Gallery, London. Following his graduation at Chelsea in 2013, Jason won the University of the Arts Mead Fellowship for 2014. 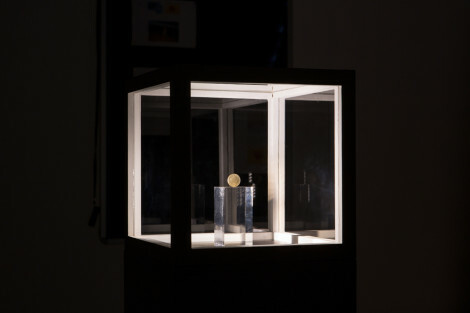 His project is titled ‘Decus et Tutamen’,(the Latin phrase meaning ‘An ornament and a safeguard’ commonly found on the edge of British one pound coins). We caught up with Jason to learn more about how his practice has developed since graduating from Chelsea, and his thoughts on the importance of collaboration and prizes for emerging artists. How do you feel your practice has evolved and developed since graduating from Chelsea in 2013? I may have moved a little bit more in the direction of traditional 2D mediums, although it doesn’t feel like a purposeful decision—it’s more that the research I’ve been doing and the materials I’ve encountered that are driving some of the works seem best addressed with those types of physical solutions. When I was at Chelsea, my work was perhaps less materialized – I often did performances or showed temporary works that implicated performance in some way. One of the works I showed in the 2013 Degree Show, called Present Absence, involved showing my own functioning mobile phone SIM card as a sculptural object. 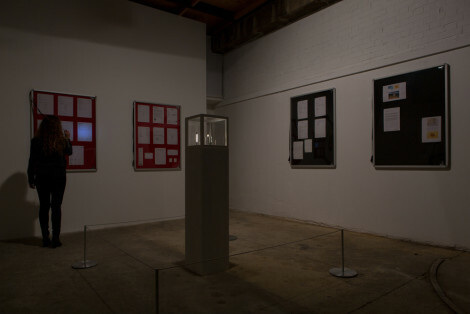 The act of showing it meant that I couldn’t be reached on my UK mobile, so it had this ripple effect of missed calls and texts during the exhibition, which I considered to be another material part of the work, or a set of displaced performance-effects. Recently, however, I showed some works in a two-person exhibition at Stroom in the Netherlands that engaged more with drawing and painting formats. One series, The Earth and the Stars, uses forensic drawings from autopsy reports at mass grave excavations in the former Yugoslavia and recontextualizes them as life-sized charcoal wall drawings, along with a shelf that preserves the carbon dust from the process of drawing. I was trying to wrap my arms around the idea of the material equivalence between the investigator doing the drawing, the subject of the drawing, and the carbon-based medium of drawing itself. I also thought that by taking evidence from the context of war crimes trials, and freeing it from the confines of its procedural truth-seeking framework, maybe it could find a way to speak to other kinds of truths beyond its limited use as “proof” of one particular fact. Has the motivation of your practice changed since leaving the structures of University? I don’t think so. I came to the Chelsea part-time BA Fine Art program back in 2009 with a fairly clear idea of what I wanted to do, and I feel like the overall motivation is still the same. But it was a long process before that for me to arrive at the point of being a practising artist. For quite a while I was an increasingly frustrated art history buff and museum and gallery visitor. I found that as I went to more shows, I developed a clearer sense of what I thought was interesting, but the result was that I saw less and less of what I really wanted to see, or I saw things being done in ways that I thought were lacking important elements. After a lengthy period of worrying that it was too self-indulgent, risky, and potentially embarrassing, I considered that perhaps the best way to make sure I would see the kind of work I wanted to see was just to make it myself. And that’s still kind of how I think of my art practice—I just make and show the things that I want to see, that I think deserve to spend some time existing in the world, and that I believe will not waste other people’s time to look at. Can you explain how you became concerned with questions of the symbolic, commodity and exchange values – and in turn how did this lead you to develop ‘Decus et Tutamen’? Well, I enjoy thinking about how we attach ideas to things and places and events—how we identify them, categorise them, and tell stories about them that give them a history—and all of the cultural, social and political contingencies that are involved. Those categories allow us to create value through trust in the truth of the story. I was particularly interested in how that functioned in the art world, as it combined aesthetics and cultural value with the commercial market for other special objects like memorabilia, which have their own individual stories attached to them. I wrote my thesis at Chelsea about that, and had thrilling conversations with my thesis supervisor, Jo Melvin, that really pushed it along. I was trying to dig into the issue of what happens if you destabilise the categories themselves, maybe create some overlap between art and something else that exists functionally in the real world. This was kind of like what my SIM-card work did—you couldn’t buy it, because buying it would destroy it, since it would no longer be my own functioning SIM card. So it used that art-life overlap to short-circuit the marketplace. But I’ve also been thinking a lot about how this functions with currency as an object. When Hans-Peter Feldmann won the Guggenheim Hugo Boss Prize in 2011, he elected to show his entire $100,000 prize in one-dollar bills pinned to the walls. It was reported in lots of art magazines as “showing the value of the prize”, but that wasn’t really accurate. 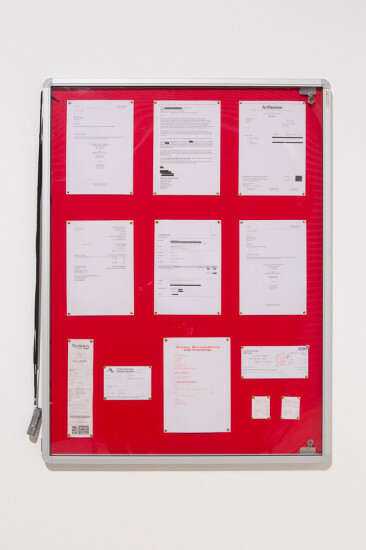 There was the 18 days of gallery assistant labour involved in pinning those bills to the wall, the value of the space where it was shown, both in terms of real estate on Central Park, as well as the institutional-reputational value of the museum, the publicity value of the prize, etc. I was thinking that by showing 100,000 dollar bills from an art prize in the Guggenheim, what you saw was actually only a small fraction of the total “value” involved. When I heard about the UAL Mead Fellowship, I thought it would be fun to propose a way to try to capture as much of that hidden value as possible and show it too, especially from the standpoint of an “emerging” artist, working in a lower-budget environment, where a lot of labour is done for free or as a favour, and where goods and services often trade at below-market rates. So I said I wanted to spend almost all of the money on the exhibition costs (even including ground rent) and publicity, holding back just one pound coin to show as a sculpture, which would be priced to sell in perfect equilibrium with the cost of showing it—£10,000 (£5,000 of costs, plus the tradtional gallerist’s markup). Frankly, I thought my proposal had a snowball’s chance of being accepted. So I was very pleasantly surprised when it was selected, and I’m even more happy with the way it turned out, especially with the support of Scott Mead as well as Pati Lara, the director of The Ryder, which is hosting the exhibition now. Is there any advice you would give to our soon-to-be graduates of BA Fine Art 2015? It’s hard to give advice to everyone since it really depends on what you want to do next, and people go in so many different directions after a fine art degree. But I would say if you feel like you have a clear idea of where you want to go with your art practice, then do it and keep doing it, even though sometimes it will feel like everything is set up to discourage you from continuing. Also, if you feel like it might be right for you and you can figure out a way to make it happen, don’t be afraid of going on to study something else that interests you that is not necessarily connected in an obvious way to the art world. Maybe this isn’t for everyone, but for me, one of the major things that feeds my art practice and provides inspiration is having an intimate connection with other, totally different fields, like law and international politics. Definitely food for thought, and we will be keeping our eye on Jason’s future works. We look forward to hearing him speak at next week’s ‘In Conversation’ event at The Ryder Gallery where he will discuss his work with Chelsea esteemed reader in Fine Art Jo Melvin. Find out more about Jason’s work on his website. 29 April – 6 June 2015, Wed – Sat 12 -6pm. In Conversation event on Tuesday 26th May, 6.30 – 7.30pm, booking required.